We cannot change what we are not aware of, and once we are aware ,we cannot help but change..Hence by, do you want to become a trendy engineer. We provide you the opportunity. 1.Hands-on workshop handled by BHARAT BENZ and EICHER. 2.Hands-on workshop handled by HONDA and FORD. 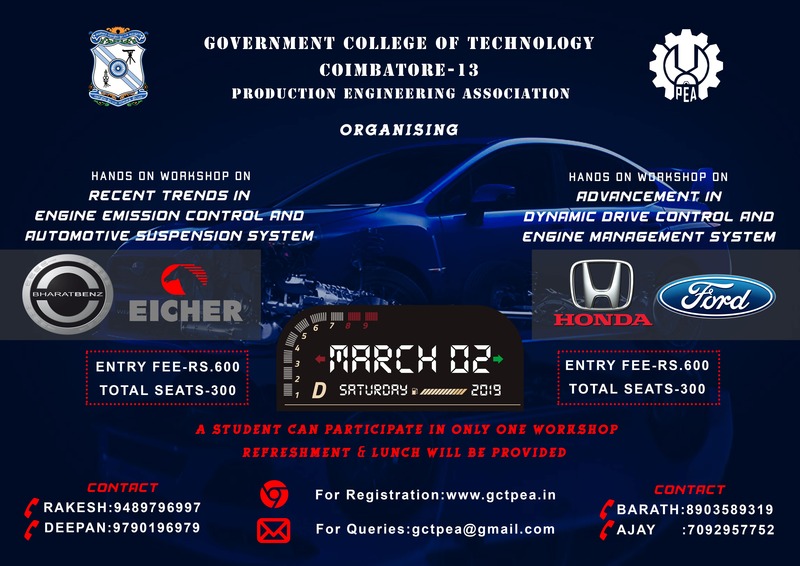 1.Hands-on workshop on Recent Trends in Engine Emission Control and Automotive Suspension System handled by BHARAT BENZ and EICHER. 2.Hands-on workshop on Advancement in Dynamic Drive Control and Engine Management System handled by HONDA and FORD. Last date for Registration - March 1, 2019. Refreshment and Lunch will be provided. From Gandhipuram Bus stand - Bus no. 70 and ask Gct bus stop. From Singanallur Bus stand - Bus no. 1c and ask Lawley road stop.